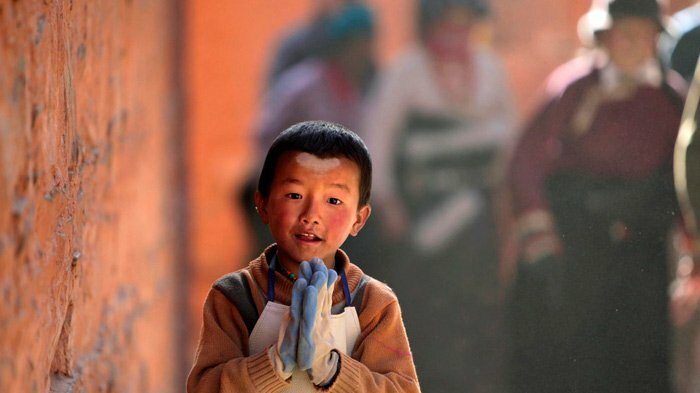 (TibetanReview.net, Jul25, 2018) – China has not only banned school children in Tibet from taking part in religious activities, including even during their summer vacation, but has also openly reported on it, saying the country’s law, which separates education from religious influences, mandated it. It has also, in at least one province, forcibly removed young Tibetan Buddhist monks from monasteries and put them in government-run schools, saying they were under-aged for monastic education. “We have sent notices to both students and their parents, and have had students sign an agreement that they will not take part in any form of religious activity during the summer vacation,” China’s official, trenchantly nationalist, globaltimes.cn Jul 23 quoted Choephel, the head of the political education department at Lhasa Middle School, as saying. The school reiterates the regulation every time in class meetings and parent-teacher meetings, not only before a vacation, the report further cited him as saying. Choephel has said the regulation mandating this was established under a guideline sent to primary and middle schools by Tibet’s education department. He has added that students were following the regulation under the guidance of their parents and teachers. He has pointed out that other schools in Tibet also had similar regulations issued under the regional government’s guideline. The report has also justified the decision on the basis of a document released by the State Council Information Office in 2016, which stated that Xinjiang Uyghur Autonomous Region disallowed underage students from taking part in religious activities. And it cited Zhang Lijuan, a professor at Xinjiang Normal University’s School of Marxism, as saying schools in Xinjiang reiterate the regulation throughout the year via notices and class meetings. He sees it as important to help young people set up a scientific outlook on the world and life. It was not clear whether any violation of the ban order attracted punishment for the children – who had signed an undertaking – and their parents. Meanwhile, in a Tibetan-populated region of Sichuan Province, Chinese authorities had been removing young monks from their monasteries and sending them to government-run schools so that they learn to “serve society,” reported the Tibetan Service of rfa.org Jul 23, citing a Tibetan source. China is said to justify this move by saying the young monks have to serve society, seeing enrolment in the monasteries at a young age as a loss to their communities, and also because they are seen as being too young and immature, incapable of thinking for themselves yet. About 20 novice monks aged 15 and under were reported to have been already removed from Jowo Ganden Shedrub Palgyeling Monastery in Zachuka, part of historical Tibet’s Kham Province. Also, around 200 novice monks had been forced to leave Zachuka’s Za Sershul Monastery on Jul 10, the report said. They were said to have been returned to their Chinese government-run schools in the province’s Sershul County.